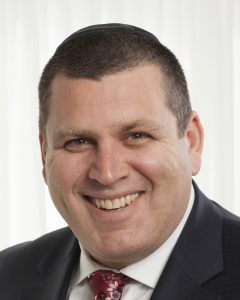 Cantor Alex Stein possesses a unique, powerful, lyric tenor voice, and is now firmly established as one of the “Great Cantors” of the cantorial world. An Australian tenor, Stein was born in Sydney to an orthodox family steeped in Jewish musical tradition for four generations. He has thrilled audiences worldwide through his concert performances. The versatility and repertoire of Cantor Alex Stein is extensive. He sings in six different languages including Hebrew, Classical Yiddish, Ladino, English, Spanish and Italian. At the early age of seven he sang cantorial selections and operatic arias at concerts, and at seventeen he was appointed Cantor to one of the largest Synagogues in Sydney, Australia. His talent and dedication at such a young age soon distinguished him as the youngest Cantor to be appointed in Australia, and this is where his full time cantorial career began. Aside from traveling the globe concertizing, Stein currently serves as Senior Cantor at the prestigious Adath Israel Congregation in Toronto, Ontario, one of the largest congregations in North America. From Sydney to Tel Aviv, Vancouver to Manchester, Toronto to Mexico, and Florida to Wellington, Stein brings Jewish music to the world, for thousands to enjoy. Cantor Alex Stein resides in Toronto with his wife Shoshanah, and their children.